When is a conduct attributable to the State for the purposes of its responsibility under international investment law? What legal instruments govern the question of attribution under international investment law? In what circumstances is the State the proper party to a contract entered into by a State-owned enterprise with an investor protected by an investment treaty? How can State policymakers minimise their international legal responsibility within the existing framework of attribution in international investment law? How can investors maximise their protection within the existing framework of attribution in international investment law? Also covered are the procedural treatment of attribution by investment tribunals, explication of such broad-brush wordings as ‘elements of governmental authority’ and ‘under the direction or control’ and the impact of the rise of State-owned enterprises as investors. Ongoing and future trends in the jurisprudence are also taken into account facilitating the understanding of the diversity of State organisation and the variety of ways in which State enterprises interact with foreign investors or act as foreign investors. 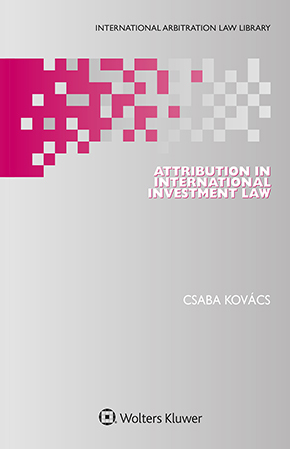 A one-stop reference on the question of attribution in international investment law, the analysis extracts identifiable commonalities among instruments and rulings, turning them into useful practice tools. This book will prove to be an invaluable instrumental reference tool for practitioners advising States or investors in investment disputes. Providing practical guidance as to the circumstances in which an act or omission is attributable to a State in international investment law, this book will be welcomed by arbitrators, in-house counsel for companies doing transnational business and international arbitration centres, and by academics in international arbitration.